Listed among the highest rated apartments in Katy, Camden Downs at Cinco Ranch features luxury one, two and three bedroom apartment homes tucked away in the prestigious Cinco Ranch neighborhood. Our pet-friendly apartments are perfectly located off S. Mason Rd and zoned to the award-winning Katy ISD, including Exley Elementary, McMeans Junior High, and Taylor High School. Check out our available apartments. Residents enjoy easy commutes across Houston with access to I-10, Westheimer Parkway, and Westpark Tollway. Enjoy living less than 6 minutes from the upscale shopping and dining at LaCenterra at Cinco Ranch and a short drive from Katy Mills Mall and Typhoon Texas Waterpark. You’ll find the city’s best shopping, entertainment and restaurants right outside your front door. Life at Camden Downs at Cinco Ranch feels like a vacation with resort-style amenities at your fingertips. Take a swim in the relaxing pool with swaying palms and WiFi, or share a picnic with friends at one of the beautiful outdoor dining areas with grills. The 24-hour fitness center is filled with cardio equipment and free weights, and the business center features WiFi, workspace, and a printer. Be sure to enjoy the nearby coffee bar and social lounge to study or meet colleagues. Camden Downs at Cinco Ranch is also kid-friendly, offering an onsite playground and plenty of green space for them to play. Rest assured your pets will love it here too, we have pet stations throughout the community along with a serene walking trail. Each Katy apartment feels like a luxury home with features like huge, open concept kitchens, pantries, granite countertops and beautiful chestnut brown cabinetry with plenty of storage. Modern bathrooms include garden tubs, walk-in closets and thoughtful details like framed mirrors, ceramic tile, and marble vanities. Select apartments offer kitchen islands, wood-style flooring, double vanity sinks and walk-in showers. Attached and detached garages, onsite storage, and at-your-door trash pickup are also available. 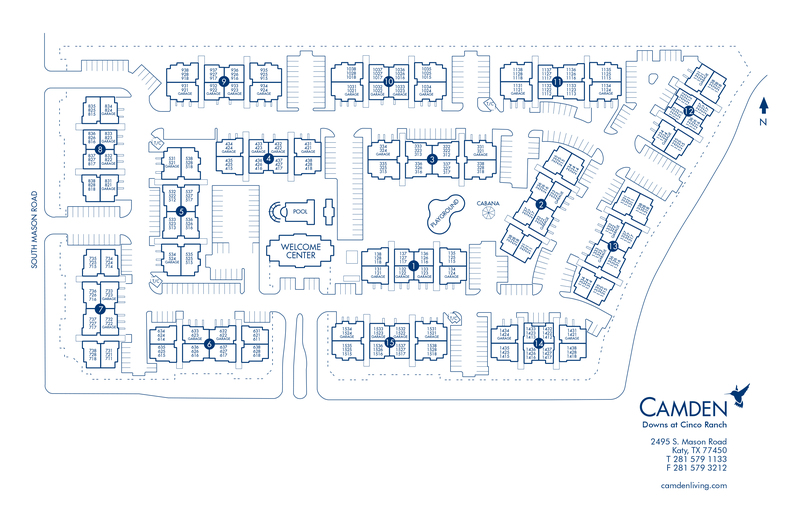 No matter where you’re from, come home to Camden Downs at Cinco Ranch. You deserve it! View our available apartments today. At Camden, your pets are family too! We welcome cats and dogs, up to three pets per apartment home.Call us with any pet-related questions! We'll save a spot for you! We offer one parking permit per lease holder. Select apartment homes include attached garages. We offer attached and detached garages for rent! Detached garages are $100 per month. Carports are available for $25 per month. We have separate visitor designated spaces too!